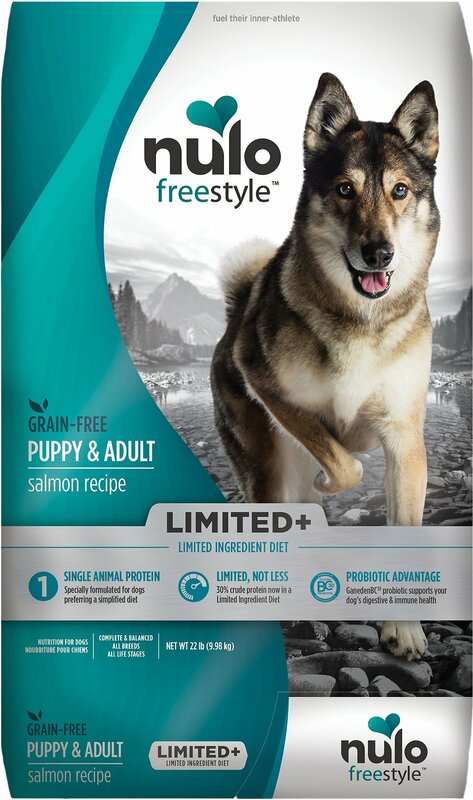 Give your pooch the limited ingredient nutrition he needs with the Nulo Freestyle Limited+ Salmon Recipe Grain-Free Puppy & Adult Dry Dog Food. It’s a simple but powerful concept—a single animal meat source for 30% crude protein in every bowl with all the vitamins, antioxidants and minerals your pal needs to look and feel his best. Plus, the formula is loaded with probiotics to support digestive and immune health, as well as omegas from salmon and canola oils for a healthy skin and coat. Your pup will love the lip-smacking salmon—the first ingredient actually—and you can feel good about the fact that it’s got zero grains or anything artificial. Single animal protein formula has salmon as the first ingredient and only meat source to support lean muscle mass. 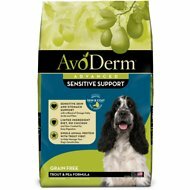 Provides 30% crude protein plus essential nutrients for a complete and balanced diet for adults and puppies alike. With GanedenBC30, specially-formulated probiotics that help support a healthy gut and immunity. 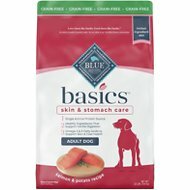 Lower in carbs with no potatoes or tapioca, and great for dogs with food sensitivities or allergies. Made in the USA without chicken, eggs, peas, pea protein, corn, wheat, soy, artificial colors or preservatives. Puppies may require up to twice the amounts shown, and nursing/pregnant mothers up to 3 times the amounts shown. My Bichon Frise has a chicken allergy and is very picky. I even tried Royal Canin and he just stuck his nose up and walked away. Now he'll eat the Nulo Freestyle Limited + Salmon just by itself - no additional meat tidbits. Thank you for carrying this food - he loves it! Our Cane Corso loves it! Been having extremely hard time looking for the right kibble for our 13 months old Cane Corso Rexor since we got him at 7 weeks. We bought him bags and bags of Premium Kibbles and Human Grade prepared dog foods to no avail. He's been having diarrhea and vomiting and allergies so it has mostly been trials and errors looking for the right kibble for a year including prescription kibbles until we tried Nulo Freestyle Limited + Salmon Recipe. This is the only one Rexor eats to the last kibble and finally no more diarrhea. We also see shiny coat and no allergies. Thank you Nulo for the excellent quality dog food. My dog developed some skin issues, she was scratching herself raw, and her fur was falling out. After several visits to the vet, being on medication, and changing her diet to a limited ingredient dog food. I found Nulo. She is thriving, her skin is clearing up, and she loves the taste. Her coat has never looked better. As long as the makers don't change their receipe, they have a long term customer. I have 2 Irish Wolfhound that have been on Ultamino for quite a few years but recently started developing more skin issues. I decided to try a different food and picked Nulo. It's only been a few weeks but so far they like it and it seems to be nutritionally sound! I was drawn to this brand due to it's limited ingredients. My husband won't agree to raw so this was my best choice based on my research. My lab loves it. I will continue to get it from chewy with auto ship. Please, Chewy, don't discontinue it!!! Great food for sensitive tummy. I have a Frenchie that can clear a room. After a week of combining with her old food, they are already greatly reduced. She also has less eye goop and redness. She is ultra sensitive and this food seems to be really good for her so far. Seriously can't recommend this food enough!! My puppers was having food sensitivity issues (read irritated, itchy skin and super soft poops). We tried several limited ingredient foods before settling on Nulo salmon and my girl is hooked. Give it at least a week!